Handmade meatballs is a simmering pot of Sunday gravy is tried and true tradition. When you are short on time but still want grandma's traditional flavors, it's time to break out the pressure cooker! Using ground turkey instead of beef is a smart swap. This recipe offers a thinner tomato sauce which helps keep it from scorching while pressure cooking. In just about 30 minutes you will feel like you have been transported to Southern Italy! Mix half the onion, bread crumbs, Parmesan cheese, 1 teaspoon salt, oregano, and pepper together in a large bowl until well combined; add milk and stir. Mix ground turkey with the milk mixture; add egg and mix using your hands in a kneading motion until it is evenly distributed. Select Sauté on pressure cooker to preheat the base; add olive oil. Sauté remaining onion, carrot, and celery until onion is starting to look transparent, about 5 minutes; add tomato puree, water, and remaining teaspoon salt. Shape turkey mixture into balls and drop into the sauce in an even layer, dropping them in clockwise and then filling the center. Start again with the second layer until you run out of meatballs. Press Meat/Stew and cook for 5 minutes at High Pressure. Let cooker cool and lose pressure naturally until the lid unlocks, about 20 minutes. Tomato puree is a thick sauce of pureed, briefly cooked tomatoes. It has been strained of seeds and skins and doesn't include any additional seasoning or herbs. It is like a blank slate for you to add your own personal touches! Per Serving: 528 calories; 29g fat; 31.6g carbohydrates; 38g protein; 177mg cholesterol; 1497mg sodium. One of my dad tricks is to grate zucchini and squeeze it dry to hide in meatballs. This recipe did well in helping me to sneak squash onto my kids' plates. I normally make them smaller and bake to get them done quickly. The boys loved the larger meatballs I was able to get in a similar amount of time thanks to the pressure cooker. They were also more tender than what I often get out of the oven. Terrific, all around. Great on subs or pasta. SO SO delicious! I ended up making a ton of these and eat way more that I should have in one sitting. They were even better as leftovers when added to sliced fresh lasagna noodles. Great recipe! These turkey meatballs are so good! Definitely comparable to or better than what I would get at a restaurant. They taste really good over pasta, and also with spiralized zucchini noodles. In love with this recipe and my pressure cooker! 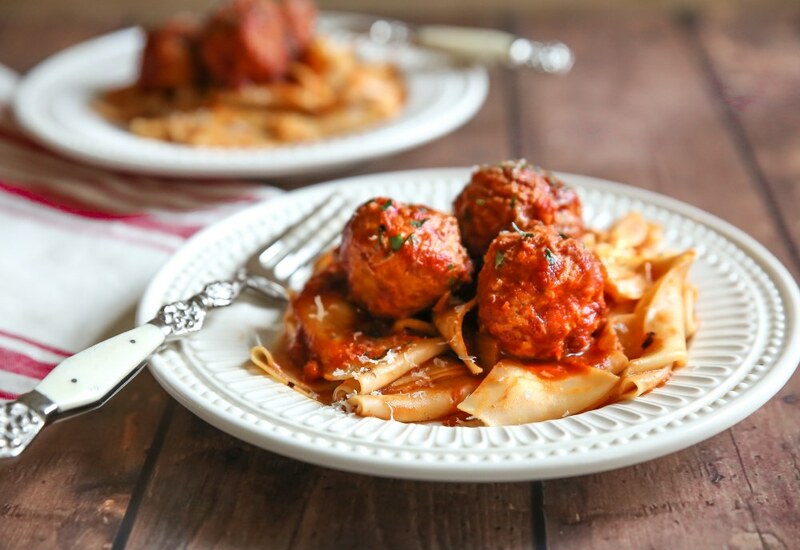 These are really good meatballs, but I especially loved the quick and simple tomato sauce. I prefer this recipe to store bought tomato sauce because it doesn't have all the added sugar. Definitely plan to make these again, it was very delicious. I was looking for a healthy turkey recipe and came across these meatballs. They were really good! I've had a couple pressure cooker fails with some other recipes, but this recipe were perfect. I served it with the really wide pappardelle noodles as shown in the picture, fantastic. It was very easy to make but the sauce had very little flavor. I added fresh basil and Italian seasoning to the leftovers. I can my own spaghetti sauce every year. Would I be able to use a quart of that instead?